A nun has been left with as many as 20 stitches after she was bitten by a horrific python outside a temple at night. 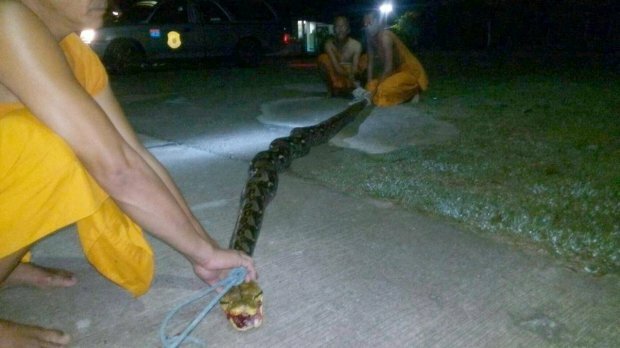 Chin Darachan is an elderly nun who was rushed to hospital after being bitten by a 26ft-long python outside a temple. According to Metro UK, Chin Darachan wandered from her bedroom to an outside bathroom in rural Rayong province, Thailand, when she was attacked. The snake lunged at the 3ft 9in 85-year-old when she opened the door – sinking its fangs into both her legs before she could escape. It then began wrapping itself around her. Monks who also live within the temple grounds heard Chin’s screams and raced to the outhouse to save her. They attacked the python with pliers and forced the deadly reptile away from the nun. 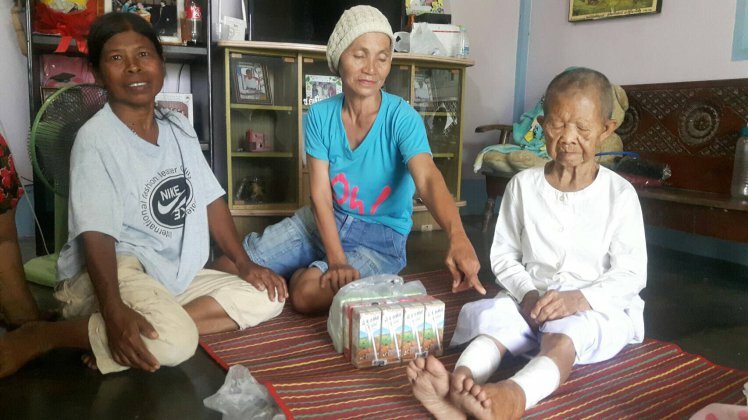 Chin, who has now returned to the temple with bandages on her legs, said: ‘I opened the door to the bathroom and saw a large snake lying down. I could not escape. ‘The python jumped at me and bit my legs. It was too fast and tightened itself around my calves. 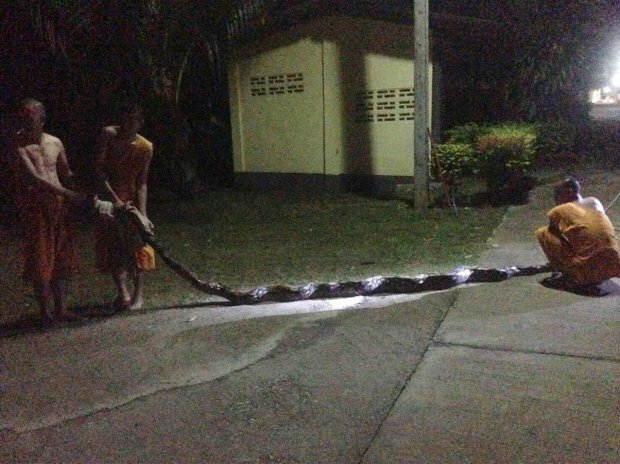 Monks caught the python and stretched it out on the ground. They estimated its size as eight metres. It is believed to have slithered into the small building from nearby jungle and found a way through a gap between the concrete wall and a metal door. Chin was rushed to the Pluak Daeng Hospital after the attack on August 7 at 10.30pm. She received 20 stitches in her legs before being discharged. The snake was later released into the wild. Chin said: ‘I don’t feel any anger towards the python. It was just doing what was natural.